Nature takes center stage in the latest exhibit at the A Gallery in West Tisbury. The show is called “hab-i-tat,” and it features three artists who each honor the organic world in their own individual way. 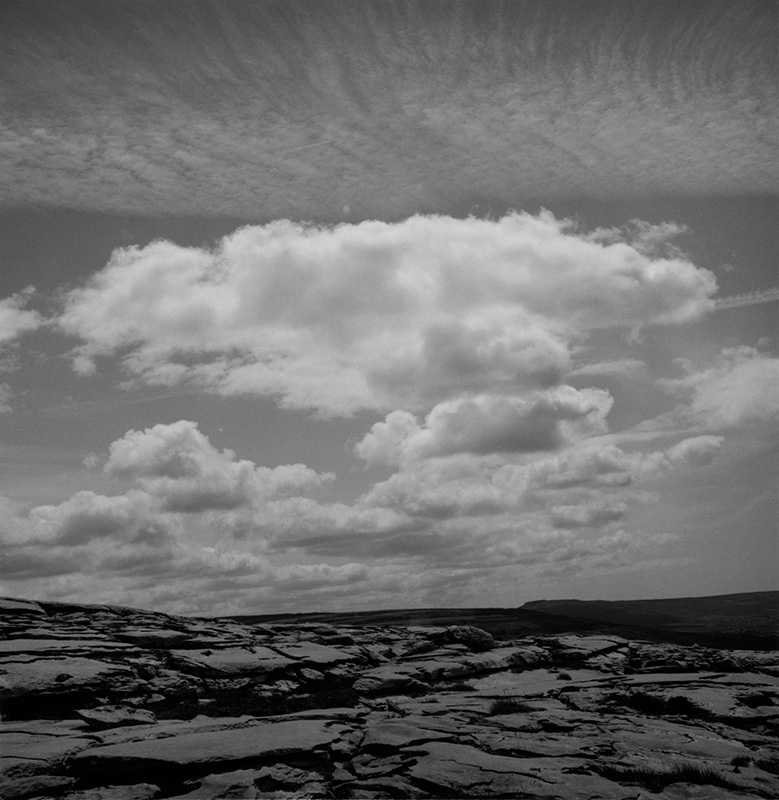 Julia Mitchell’s tapestries, Lucy Mitchell’s works on paper, and Marianna Cook’s gelatin silver photographs display some of the many ways that art imitates nature. 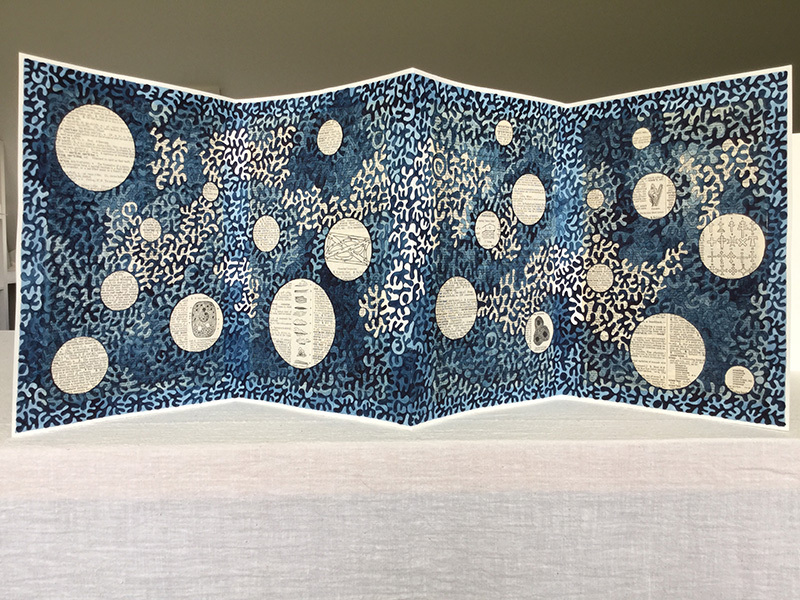 For years Lucy Mitchell has worked with paper, combining her chosen medium with elements from nature. One of her ongoing series features samples of seaweed pressed onto paper and embellished with watercolor ink. 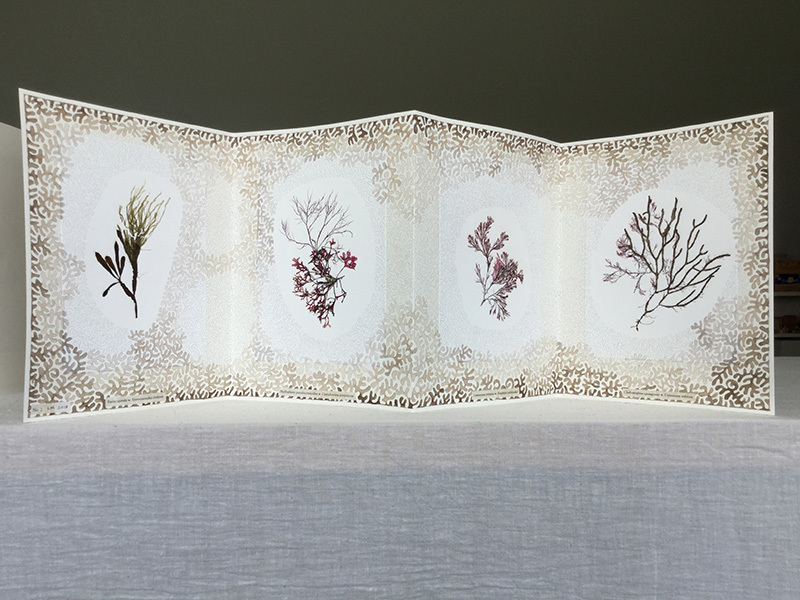 Mitchell calls this collection her “Seaweed Herbarium.” She displays these pressings in the form of folded freestanding books, each made up of four individual prints that can be displayed on a tabletop or other surface, or framed as a single flattened page. 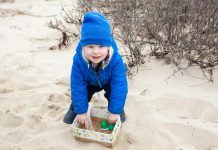 Mitchell has for years collected things during her nature walks and travels — everything from bones and eggshells to rocks to sticks and other plant materials. Having been born and raised on Martha’s Vineyard, it’s no surprise that the gifts of the ocean have also inspired the artist. She learned how to preserve seaweed from her mother, who taught her the multistage process involving floating the delicately tendrilled plants in water, capturing them on submerged paper, and then pressing them over time. Lucy Mitchell’s sister, Julia Mitchell, works in a very different medium, although her inspiration mirrors her sister’s. Julia Mitchell creates beautiful works of art using a loom and thread the way a painter would use canvas and paint. Her stunning tapestries involve hours and hours of meticulous work — building up blended colors and texture by mixing up a wide variety of threads in various shades and types. 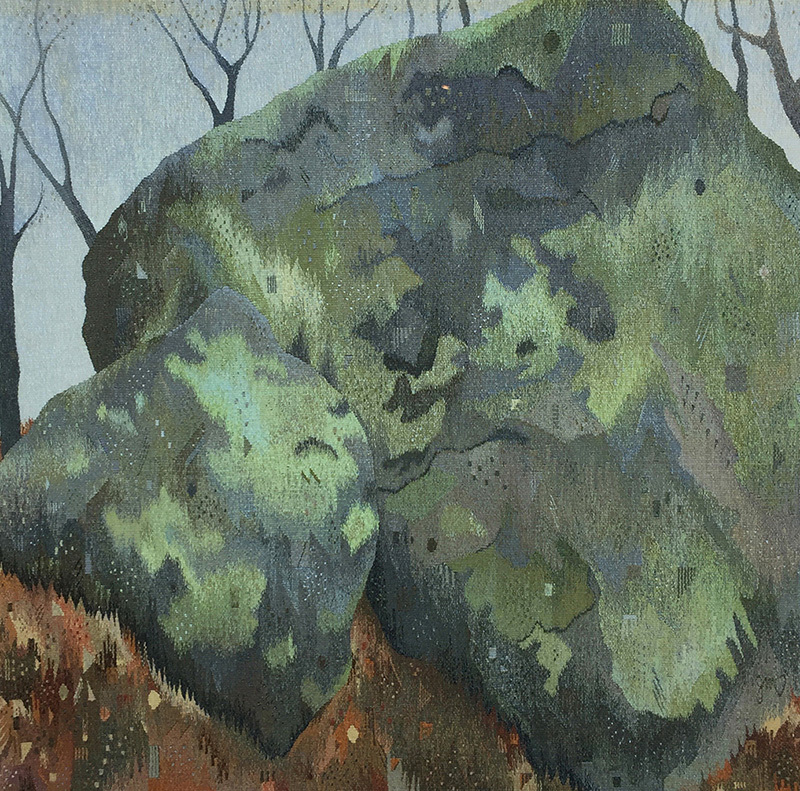 Her latest piece depicts a moss- and lichen-covered erratic granite boulder called Signal Rock. The iconic boulder played a role in Mitchell’s childhood — she and her sister would often climb atop it as children. The large-scale tapestry is a wonderful study in greens and earth tones, and the fiber media allow for lots of texture, imitating the craggy, rough nature of the stone surface. A series of smaller tapestries depict some of the plant life in the vicinity of the boulder. Julia Mitchell, like her sister, has always been inspired by the natural world. Her images often feature trees, plants, marshes and ponds, and, of course, seaweed. Photographer Mariana Cook focuses on both people and nature in her work. Previously A Gallery showed a number of Cook’s portraits. 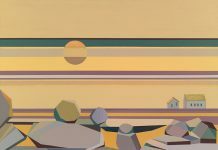 This time around, her landscape work will be on display. 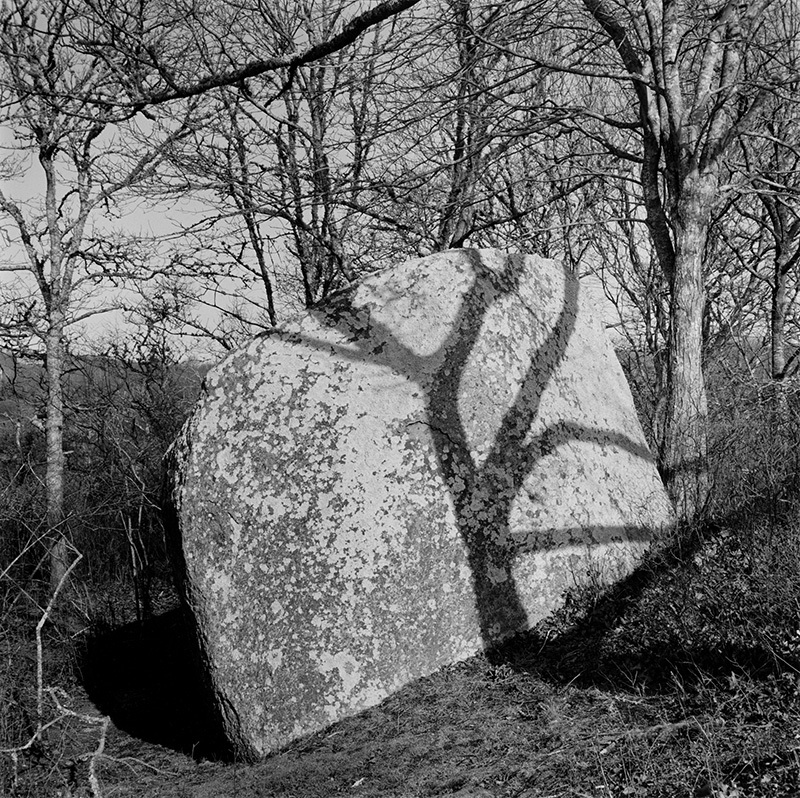 The last surviving protégée of famed photographer Ansel Adams, Cook clearly has a reverence for the natural world and an ability to impart a sense of majesty to her subjects, such as a Chilmark boulder, which she has captured with a tree shadow creating an interesting vein pattern on the rock. Cook’s work can be found in museum collections all over the world, including at such storied institutions as the Metropolitan Museum of Art, MOMA, the National Portrait Gallery in Washington, D.C., and the the Musee d’Art Moderne in Paris. Of all of the artists currently showing work at A Gallery, Cornand may have found the most personal connection to nature — in a literal sense — but each of the three women included in “hab-i-tat” clearly have an intimate understanding and appreciation for the natural world. The exhibit “hab-i-tat,” featuring the work of Mariana Cook, Julia Mitchell, and Lucy Mitchell, will hang at A Gallery, 510 State Rd., West Tisbury, from August 4 to 22, with an opening reception on August 14 from 5 to 7 pm.